While at Phipps Conservatory and Botanical Garden in Pittsburgh, Pennsylvania, there was a sunflower in their vegetable garden that caught my attention. 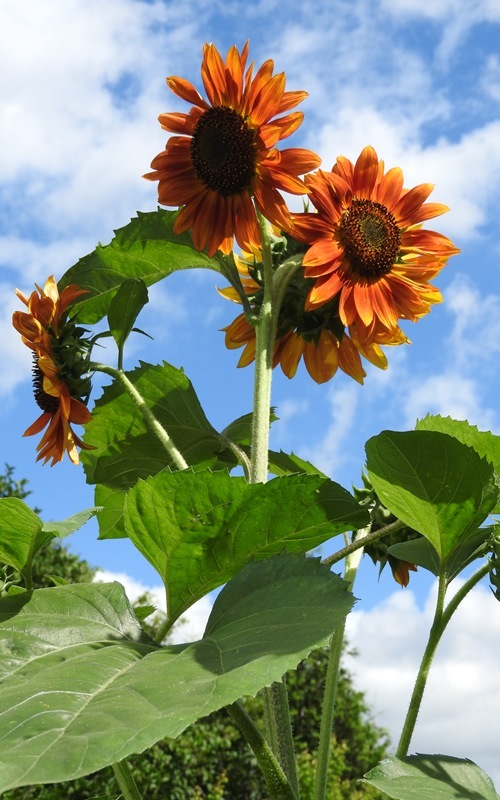 ‘Birds & Bees’ is a 6 – 8’ tall sunflower that has golden-yellow petals and chocolate discs. While flowering, sunflowers offer a pollen and nectar source for foraging honey bees, native bees and many other garden pollinators. At maturity, these black seeded sunflowers of ‘Birds & Bees’ provide oil-rich kernels. The shells are described as somewhat softer than others. Gardeners describe this plant as high yielding, providing an abundance of nutritious feasts for birds as the season progresses. If you like sunflowers and haven’t tried this variety, make sure that it makes your plant list in 2018.